Sales Question and Answer #13 - Are company backorders costing you the sale? Sales Question and Answer #13 – Are company backorders costing you the sale? Q. Help! I’m so frustrated. I just attended a “sales training” program that never addressed the real issues that I have to deal with every day. What causes me problems is not my lack of sales ability, it is my company’s back orders, the lack of responsiveness and competence in my customer service people, and the mistakes in delivery by the warehouse. Those are the real issues. What can I do about those things? A. Thank you for a “real world” perspective on the real issues that impact the ability of real sales people to do their jobs. I appreciate you asking the question that so many sales people are hesitant to ask. Believe me, I understand. For much of my life, I dealt with those same issues. It seemed like my results (and my income) were totally dependent on how well someone else did their jobs – materials management, customer service, delivery, etc. No matter how effective I was, my efforts could be totally sabotaged by a problem in inventory, quality control, warehouse or delivery. Keep this in mind. Your customers may point out your problems with delivery, back orders, or quality. As a result, you think that your company is the worst performer out there. The truth is that your company is probably no worse than your competitors. Your customers may complain about you, and since you are the one fielding the complaint, you take it personally and think it is just your company they are complaining about. Trust me, when your competitor is calling on them, they are likely saying the same things about his service to him. So, your reaction is probably a bit too extreme for the circumstances. Unless you are going through a particularly horrible time, you are probably no worse than your competitors. You probably don’t have any more problems than your competitors do. So, first, realize that the situation is probably not as bad as you think it is. Relax a little bit. 2. Communicate the specifics to the appropriate powers within your company. A. Specifics. Don’t say, “We’re losing business because our price is too high!” Do you know how many times your management has heard that? Hundreds. It has no meaning because it is too general. Say, instead, “I lost a deal for $10,000 at XYZ Corporation because our prices on ABC products were 4% higher than our competitor, CCC Company.” Your boss can’t deal with generalities that have no substance to back them up. But he can deal with the specifics. If you can’t collect and communicate specifics, you’re not going to be persuasive. B. The appropriate powers. If the problem is delivery, take your case to the head of shipping. If your problem is back orders, take your case to your material manager. Communicate the specifics to those people who have the authority to do something about them. Complaining to your colleagues will not solve anything. 3. Do what you can do to alleviate the problem. I understand that the problem is some other department or person. However, I also know that your behavior influences your company’s ability to perform. And, while you can’t change other people, and you can’t change other departments, you can change your behavior. So, search for the little things you can do that will help with the problem. a. You could be more conservative in your promises to your customer. Instead of promising that new item next week, you could say, “We should be able to deliver that first order within 30 days.” Manage your customer’s expectations. A back order is an order that isn’t received when the customer expects it. Change his expectations, and you’ll impact your back orders. b. You could communicate new demands to your materials manager before it happens. If you expect an order for a substantial number of gadgets, for example, let your materials manager know how many you expect to sell and when you expect to do it. Don’t let the actual order be a surprise to your inventory control person. c. You could check on your inventories of an item before you promise delivery of it. You could take a moment to check to see if you have sufficient stock of an item before you tell the customer that he can have it next week. Don’t misunderstand me. I’m not saying that you are the reason for back orders, or mistakes in shipments, etc. But, you are part of the system. And, by changing your behavior, you can influence the performance of the total system. Accept your responsibility to do what you can to help the situation. When you are in the heat of the battle away from the office, it is easy to imagine the incompetent and uncaring people who manage things inside. However, when you go speak to them, and see the situation from their point of view, you’ll often discover that they are just as intent on serving the customer as you are. They are, in their areas, just as competent. Instead of pointing fingers from a distance, see the world from their point of view, have some empathy for them, and trust them to do the job for which they are paid. 5. Be proactively honest with your customers. Don’t make promises you can’t keep. Don’t make excuses that aren’t real. Don’t blame anyone else. Admit your company’s problems, be honest about what you are doing, and offer the customer some options. I’d proactively identify the problems, create solutions, and then be the one to inform the customer of both. 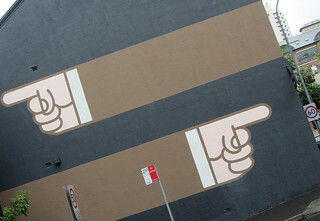 Image “Pointing fingers” by Newtown grafitti on Flickr under Creative Commons license.